Applicants must file their removal of conditions application within the 90-day window immediately before the conditional green card expires. Failure to do so can result in serious consequences including removal from the United States. If all goes well and the conditional permanent resident card is approved, the 10-year permanent green card is mailed to the applicant. The adjudication process for an I-751 application can vary widely. I-751 applications that are filed jointly with the US Citizen spouse may take anywhere from 6-8 months to process. Waiver applications filed by the green card holder alone, may take anywhere from 8-12 months to process. Waiver applications are more heavily scrutinized and typically require an interview to be conducted, however waiver applications are not always scheduled for an interview. Sometimes a request for evidence is sufficient to take care of any additional evidence to establish that the marriage was entered in ‘good faith.’ If the immigration officer reviewing the application determines that more information is needed such as additional proof of bona fide marriage, or if they feel that the applicant’s testimony is necessary to determine whether or not the marriage was entered in ‘good faith,’ then an interview is likely to be scheduled, for both jointly filed and waiver applications. Can you travel internationally while your application is pending? Yes, as long as you have a valid unexpired green card you may travel internationally once you have filed your removal of conditions application with USCIS. Here is the crux. You must remain in the United States to attend your biometrics appointment and appear at the designated ASC office so that USCIS may take your fingerprints. You should not travel internationally until you have done this. If no request for evidence is issued or interview notice is issued, the typical processing time for a jointly filed application is 6-8 months. Waiver applications may take anywhere from 7-12 months to process. If your application is taking more than 12 months to process, you must make an Infopass appointment to receive an extension of your conditional permanent resident status, especially if you must travel internationally. 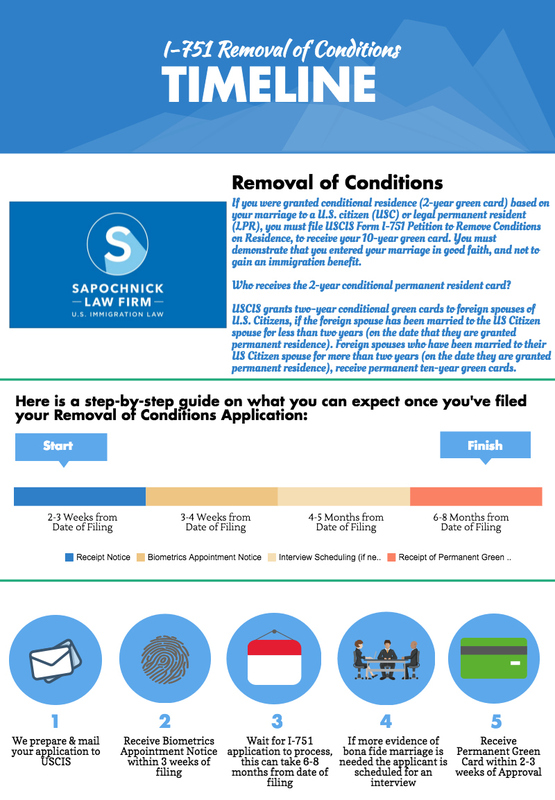 To know more about what documentation is included in the I-751 application to prove bona fide marriage, please read our guide to removal of conditions and the information on our website.